Freewing partnered with Aviation Design, the original creators of the Super Scorpion, to scale down their large turbine-powered fiberglass jet into a compact electric powered 80mm EDF foam variant. 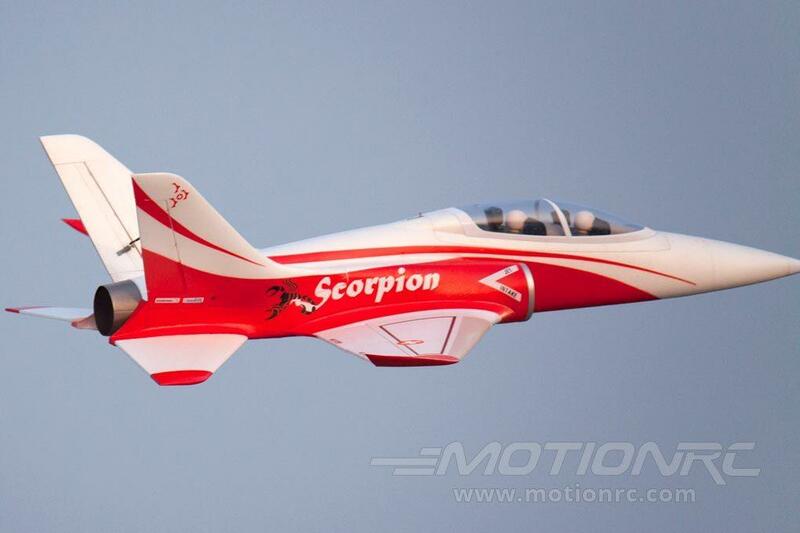 The same exciting sport jet characteristics of the original Super Scorpion all remain: stable acrobatic maneuvers at all speeds including four point rolls and tall Cuban 8's, a predictable and gentle stall behavior, agile flight characteristics, slow full flap passes and landings, and more! Pilots can experience the performance handling of a purpose-built sport acrobatic jet in a unique design which is sure to turn heads at your local flying field. Freewing's 80mm Super Scorpion is the perfect size for easy transport yet still containing the thrust of a 6s 80mm 12 blade power system. The rigid, carbon fiber reinforced wings are removable with screws, as are the unique vertical stabilizers, and full flying horizontal stabilizers. Metal gear servos on the elevator ensures positive control. The Super Scorpion also uses the larger Stinger 90-sized nose retract and trailing link struts all around for durable grass field operation. Plastic main gear doors and a spring-hinged full coverage nose gear door minimizes drag. A smartly designed NACA duct in the bottom of the nosecone draws air into the battery compartment to cool the battery. For pilots who have flown other aircraft in Freewing's 80mm Jet Series, the Super Scorpion blends the stability of the F-86 Sabre in an agile package slightly slower than the Mirage 2000. While the Super Scorpion has a wider fuselage than the Mirage, we appreciated the Super Scorpion's larger battery bay to accommodate our 6s 4000, 4500, or 5000 mAh-sized battery packs. The Super Scorpion is designed for intermediate to advanced EDF pilots.